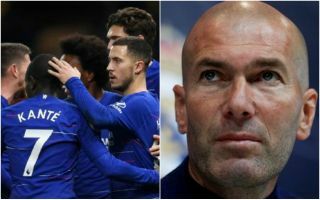 Manchester United manager target Zinedine Zidane is reportedly keen on a number of transfers for his next job in management, among those Chelsea forward Eden Hazard. This is according to Don Balon, who also mention big names like Manchester City star Bernardo Silva and Paris Saint-Germain’s Marco Verratti as names on the Frenchman’s radar. Zidane has long been linked with the Man Utd job, with the Sun recently listing him as one of the club’s long-term targets to replace Jose Mourinho, despite Ole Gunnar Solskjaer recently coming in as interim boss until the end of the season, even if he is also mentioned as being in contention to get the job beyond this campaign. If United do end up hiring Zidane, it could mean snapping up a huge talent like Hazard, who might not be as unrealistic a target as he seems due to his contract situation at Chelsea. The Belgium international is yet to extend his current contract at Stamford Bridge, which is due to expire at the end of next season. This makes Chelsea vulnerable to losing him on the cheap before then if they are to ensure he doesn’t end up walking away on a free transfer in summer 2020. Hazard would undoubtedly make a fine signing for United as a replacement for the struggling Alexis Sanchez, having consistently been one of the best attacking midfield players in Europe for the last few years. Don Balon have, however, also recently linked Zidane with Bayern Munich, so it may be that he and Hazard will end up together somewhere else, but if he gets the United job it could be huge for them in terms of helping them land a world class talent. United fans, who do YOU want as manager next season?